This mat is so cute and modern . The polka dots are very different from traditional mats . I’ve received many compliments. I layered it with a bigger rug under to give it a dressed up look. Let our doormat accentuate your entryway while keeping dirt and debris outside. Made of 100-percent natural coir with a non-skid vinyl backing, this mat is weather resistant and easy to care for. Invite guests into your home with a warm welcome before you even answer the door. 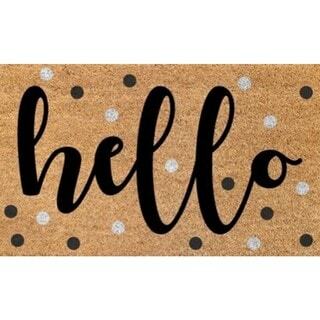 Such a cute welcome mat and great quality. The grey and white polka dots match my house so well. The mat is thick and heavy duty so I know it will withstand all weather. Also does not slide around or move on my cement patio. Great quality, perfect welcome mat! This is the perfect size for a welcome mat or for the back patio. It is thick and fits in front of our door and looks adorable! Reasonably priced as well. I ordered this rug for my entry door. Love It! It seems durable. And SO cute! Just ejat i've been looking for! A great welcome mat! Not typical and boring door mat..it's fun! Would recomment. I am very happy with this rug. 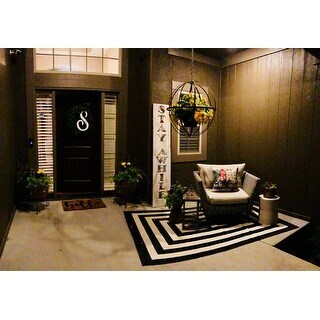 It may be a bit more narrow than what I was looking for but it really looks good and compliments the front porch. It is decent quality and doesn't appear it's going to shed easily or loose the print with a normal amount of traffic. Holding up very well. It's thick and the print is deep.We like it. Love it! Was a great addition to my front door. It does the job and doesn't shed a whole bunch. Shipping was unbelievably quick. Product is well made and beautiful. Was packaged well. Highly recommend. It’s diffrent and it looks cute. Mats Inc. Scrape 'n Sorb Outdoor Entrance Mat, 18" x 30"
See You Later Alligator Doormat - 100% Olefin Welcome Rug - 27 in. x 18 in.